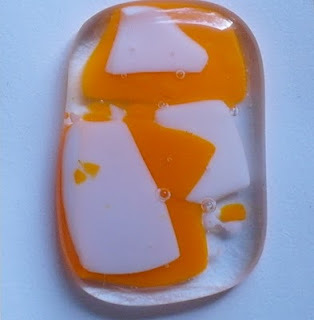 It's Handmade Monday time again and this week I thought I would show you my very first glass pendant. I finally got to buy a kiln after an age of saving, it is something I have wanted for a long time and it felt brilliant to get it delivered. I've just got to find a good name now for it :) My mum has suggested Trevor after my dad, as it is full of hot air and takes ages to do anything (we love you really dad!) but I'm not sure... one to think about I think! I have to buy some cutting tools as my skills in that area are none existent and snapping down the score line with my hands isn't producing the results I want (and I'm probably risking my skin!)... so a pair of running pliers are on the 'to buy' list. 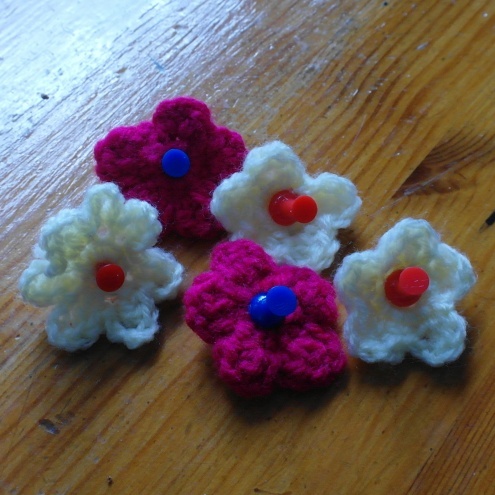 I also have this picture of some crochet flower pin board pins, I made them a few months ago but have only just got around to photographing them as they have been pinning bits of paper to the notice board in the kitchen. Have a great Hand Made Monday everyone, I'm off to have a look at what else has been made this week. Always great to get new bits of kit and you've certainly put it to good use with that pendant, I love the effect and what a lovely way to use crocheted flowers - mental note made of that one. Lovely colours. The reasons for the name of your new kiln is great. Way to go Harriet!! I'm sure you're going to have a lot of fun with your kiln! That glass looks lovely - I think the bubbles look like little eyes - I can see amazing creatures in that pendant! Good luck indeed. I'd love my own kiln, maybe I should start saving although there are so many things on my list I think it will take forever. Loving the pendant. How wonderful, I too would love a kiln maybe one day. Love your first pendant, and look forward to seeing the next. I love the orange in the pendant and the flowers are gorgeous!